Shift – the End of Texting While Driving? This is a guest post written by Rohan Kharbanda and Chris Olsen, graduates of the Masters Program in Human Computer Interaction + Design, headed by Linda Wagner at University of Washington in Seattle. 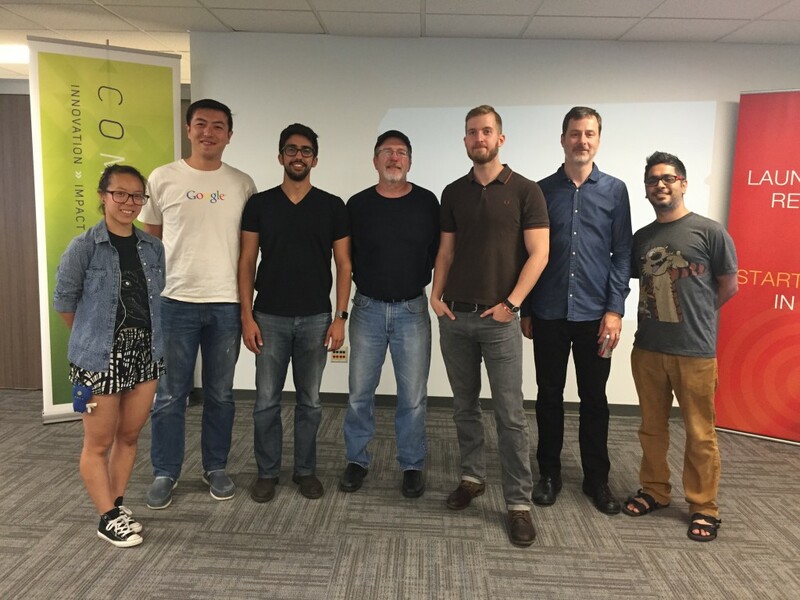 The ustwo auto team – David Mingay, Tim Smith and Harsha Vardhan – worked with this group as advisors on their capstone project, after being approached following the publication of their cluster thought piece. The project deals with the distractions involved in texting while driving. Using existing technology and targeting ordinary human behaviours, it brilliantly flips the problem on its head to place the responsibility on the sender, rather than the driver. For a quick look at the solution in action, you can check out their video. We think this approach is both clever and brave, and it's backed by a team asking the right questions at the right time. We would be happy to hear what you think! 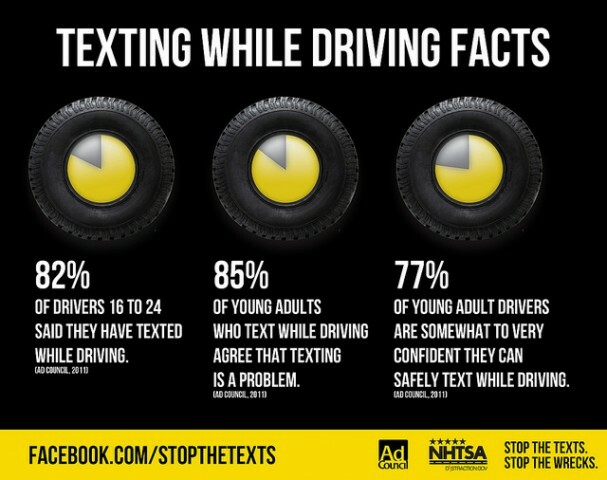 How many of us have texted while driving? Chances are, if you own a car and a cell phone, you have at some point in time used (or at least tried to use) both of them together. Some of us even do it regularly and probably think that we are good at it. Even though that might be the case, it doesn’t change the fact that it’s still a dangerous endeavour that puts us and others at risk. Unfortunately, phone use while driving is a behavior almost as common as driving itself. Which is why we, a group of students in the Masters in Human Computer Interaction + Design program at University of Washington, decided to address this problem as part of our capstone project, in partnership with the ustwo auto team in London. The recent success of the ustwo thought piece on tackling the redesign of the car instrument cluster, and the widespread media attention it received, made them a perfect partner for such a project. A six-year study by the AAA Foundation (American Automobile Association) rated in-car activities of thousands of US teen drivers (talking to passengers, adjusting the radio, phone use etc.). The most prevalent distraction was other passengers, followed by phone use. Phone use is very distracting because it takes the driver’s hands off the wheel, eyes off the road and mind off the task of driving. While there are numerous reasons why texting and driving is dangerous, the single statistic that stands out the most is that there is on an average of one teen death per day in the United States alone, which can be directly attributed to cellphone use while driving. The question then is why is this such a prevalent problem? We found a nationally recognized expert in research on distracted driving at University of Washington, Dr. Linda Ng Boyle. She runs the Human Factors and Statistical Modeling Lab, home to numerous studies conducted on distracted driving. We spoke with her and read many of her papers and learned several things – most importantly that people genuinely believe they are better drivers than they really are, and that multitasking while driving is less safe than some might think. Another piece of valuable information was that status indicators and feedback are very important for improving a person’s situational awareness. We next researched existing products that attempt to deal with texting while driving. 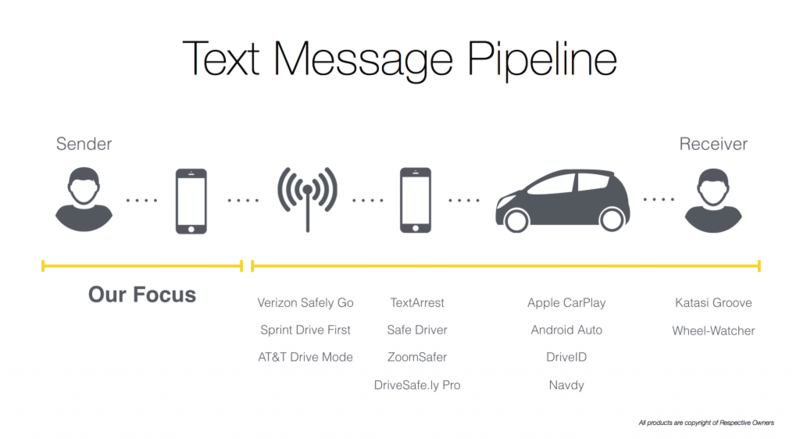 We looked at the pipeline of a text message (from origin to delivery) in the context of driving, and mapped some of the existing solutions to each step in this process. We realized that all existing solutions are oriented towards altering the behavior of the driver, by blocking phone use altogether or providing alternate ways to operate your phone (HUDs, in-dash displays etc.). In today’s day and age, digital communication has invaded every aspect of our lives. Every notification received on our devices triggers an involuntary reaction to check and take an action immediately, or at the very least a glance. Considering this, we realized that any solution that discourages, prohibits or blocks drivers from this behavior is a forced solution that will probably not be successful in the longer run. The in-car solutions that give you access to your phone’s functions through mounted screens or HUDs do not really eliminate distraction - at best they only reduce it by a little bit. So we asked ourselves, instead of trying to change the driver’s behavior, can we shift some of the responsibility of safer texting away from the driver? How do we design an intervention that focuses on using the sender as the filter instead? We decided to do a quick preliminary investigation. We asked 10 frequent texters ages 18-24 whether they consider the context of the receiver when sending a message. We also asked whether knowing that their recipient was driving might change their texting behavior, or alter their expectations of that interaction. Of the 10 texters, 8 said that they do not think of the receiver’s context prior to texting. When asked if they would continue to message if they knew that the recipient was driving at that time, 5 said they would not. In later user testing however, this percentage turned out to be much higher. Armed with this little bit of validation we set out to design a solution that leverages people’s concern of others’ safety to promote a safer driving behavior. The interaction model we designed for our solution can be implemented on any mobile operating system and any messaging platform. However, for the sake of our implementation timeframe, we decided to constrain our implementation to iOS, and use iMessage as the platform. The solution we designed is called Car Mode. It is much like Airplane Mode, except that it does not need a flight attendant to remind you to turn it on. The beauty of Car Mode is that it is totally automatic after a one-time bluetooth pairing of the car with the phone. After the pairing, every time the user starts the car, the bluetooth connection is made and Car Mode is engaged – the driver doesn’t have to do anything. 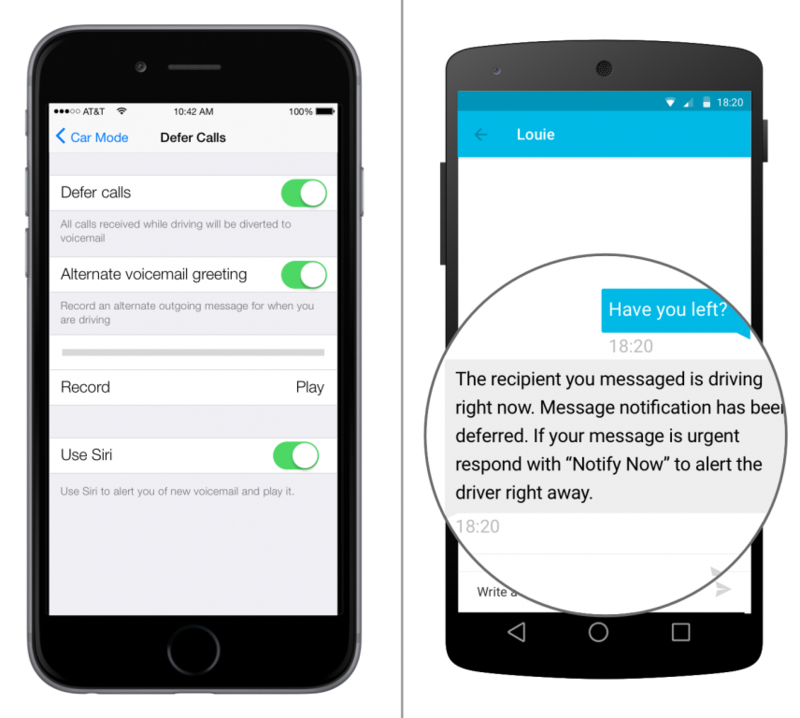 Once Car Mode is on, anyone who attempts to message the driver will be notified that their intended recipient is driving, and that the receiver will not be notified until after driving. This forces the sender to consider the context and adjust expectations accordingly while composing the message. The sender may even decide not to message at all. Senders can override this deferred notification if they think that the message is important enough. Adding this extra step to override the default behavior discourages users from circumventing the system constantly. Important messages are relayed to the driver while driving through Siri. This is the least distracting method of message delivery, because it leaves the driver’s hands on the wheel, and eyes on the road. To protect driver privacy, Car mode can be configured such that only a selected group of contacts have visibility of the driving status. Car mode does not require any setup to work (except the one-time pairing of the phone and a bluetooth device in the car), but it does offer a lot of customizations to personalize the experience. We believe that effective solutions should just work out of the box, and offer users enough control to make the solution work for them rather than the other way around. Car Mode customizations can be accessed under the settings menu. All default behaviors, such as engaging automatically and deferring notification, can be customized to the user’s preference. These settings can also be locked using parental controls thereby allowing parents to enforce safer driving behaviors for their teens. The default for Car Mode is to engage automatically when connected to the car via Bluetooth. 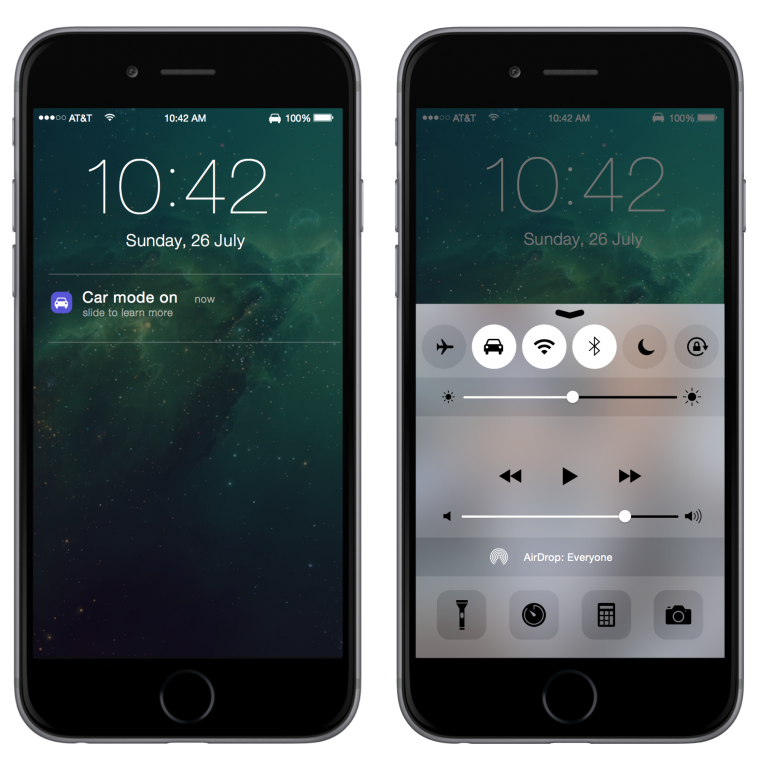 However, to set the status manually, we envision a “Car Mode” button in the iOS control center. It is estimated that 90% of all cars on the road today have Bluetooth connectivity. For cars that do not have that option, many users use aftermarket Bluetooth dongles to connect to their car stereos or OBD ports. As a protocol, Bluetooth is widespread and platform agnostic. Bluetooth allows users to configure Car Mode to work with one or more cars. Further, it frees the solution from requiring any costly external hardware for it to work and thereby increasing the chances of adoption. 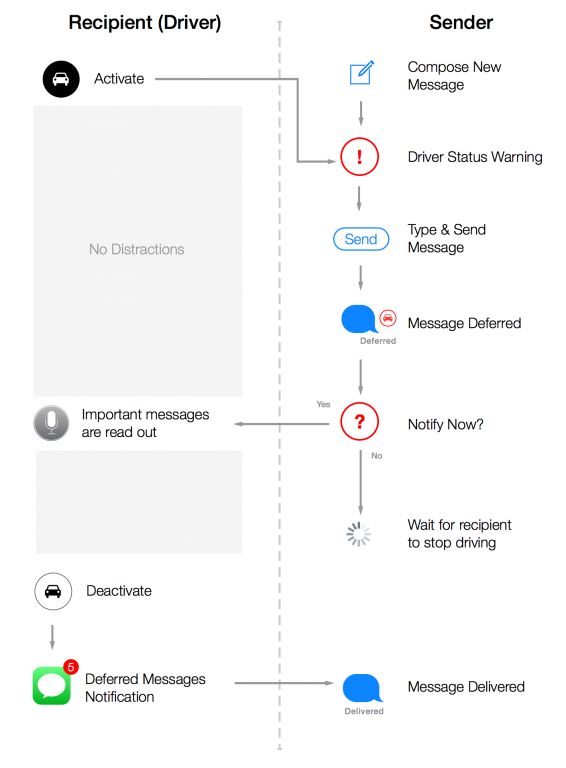 Whenever users try sending an iMessage to someone who is driving, they are shown a red microtext in the message thread indicating that the recipient is driving. 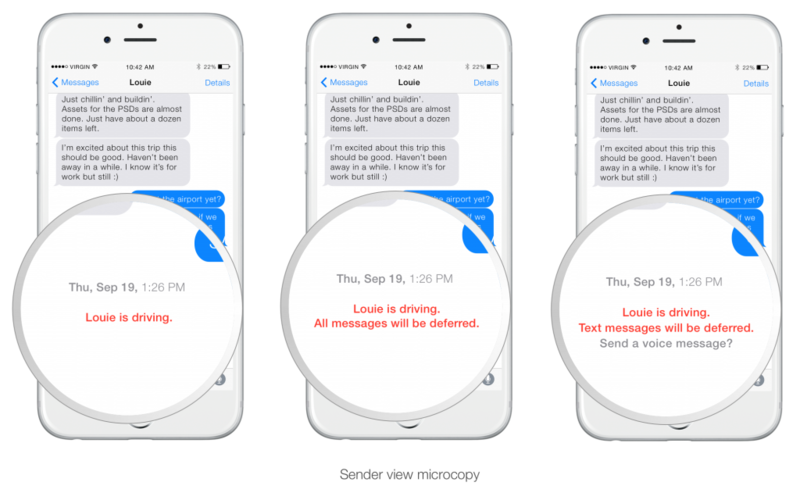 If the driver has configured voice messages to be allowed, iMessage senders are prompted to consider sending a recorded voice message instead. Should the sender still go ahead and decide to send a message, a deferred message warning is shown next to their message. The interaction for this prompt is the same as the existing interactions for messages that fail to send. Tapping on the warning icon will present the user with an action sheet with the option to force send the message. We've built a small prototype which you can view here. Car Mode has two distinct users - the sender and the driver. For the sender side of the equation, we built paper prototypes of the iPhone screens and put them in front of 20 testing participants within our target age group of 18-24. All our testers saw and understood the red microtext notification. After seeing the deferred notification, of the 20 participants, 9 said they would use the default behavior and send the text message with deferred notification, 8 said they just wouldn’t text at all until later, 2 said they would send now but make their message shorter and expect no return message for awhile, and 1 said he would send now with no change. 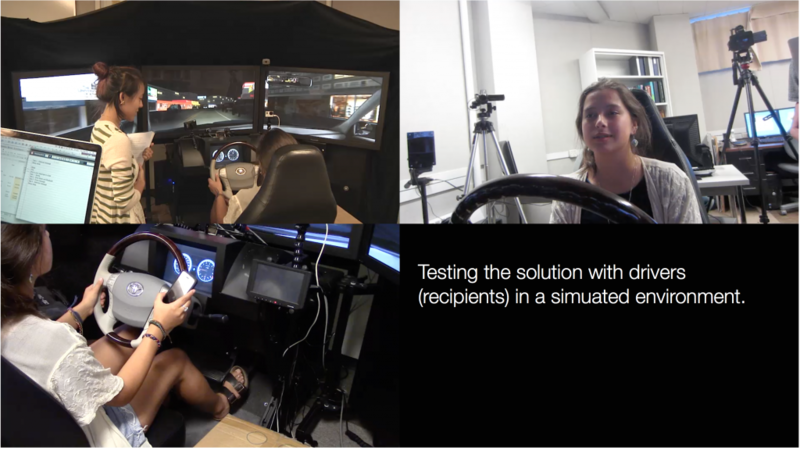 We also tested the solution with “drivers” in the driving simulator housed in the University of Washington’s Human Factors and Statistical Modeling Lab. We put 5 participants within our target age range (18-24) through a 30 minute process - 5 minutes of general questions about their texting habits, 20 minutes in the simulator, and 5 minutes of wrap up questions. While using the simulator, we first sent them a message on their own phone, to see actual practice of their current behavior of receiving a text while driving. We then gave them a prepared iPhone with an interactive prototype, and noted their reactions to 1) Car Mode turning on, 2) a forced message coming through while driving (delivered via Siri), and 3) deferred notifications showing up on the phone after they stopped driving. Drivers understood that messages that came through while driving were time dependent and relevant to their driving situation. Deferred messages were interpreted as less important and more social in nature. Without being informed that it was the sender who was determining urgency of the message, our drivers were curious what “magic” was behind the system’s ability to filter the important texts from the trivial ones. It became clear to us that users need to understand both the driver and sender sides of the Car Mode equation to fully understand the product. Even though we believe that the concepts are simple and easy to grasp, it was surfaced that a short tutorial or onboarding experience might be a great addition to provide more details to the curious user. Users liked the product and how it reflected their natural filtering behavior. We observed that each user has his/her own way to perform text “triage”, determining whether the sender or the topic is worth dealing with right away, or waiting until later. For the sake of rapid iteration we tested the idea only for iMessages. However, the underlying interaction model can be easily modified to work with regular text messages using an auto reply option. 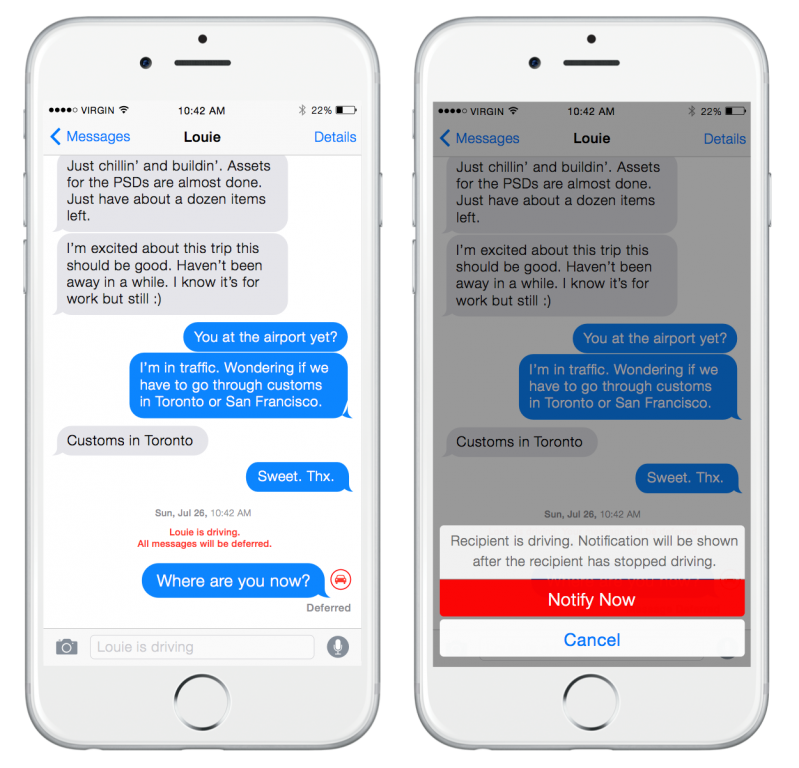 Senders on a non iOS platform receive an automatic response to their text with instructions to force send the message. This ensures that the solution works in all scenarios. The solution as it exists right now is a proof of concept. Our initial evaluation and testing strongly suggests that it will be received favorably by users. It uses existing technology and leverages human traits of empathy and concern to drive a positive change. The solution does not arm-twist users into altering their behavior - instead it handles and/or delegates the responsibility of filtering text messages to the device when driving. The fact that it mirrors existing responsible user behavior, i.e. screening for important messages and asking someone else to reply on your behalf, if required, makes the solution a prime example of a user centered design. We strongly feel that making the solution an OS level feature is the surest and easiest way to ensure a widespread adoption. At a time when all apps and services are pushing to be more context aware, providing access to the user’s driving status (much like how permissions for location access work right now) can serve as a useful data point to trigger contextual behaviors. It would be interesting to see how other apps might use this knowledge of context to add to the user experience. For example, navigation and music player apps could create contextual UIs that provide bigger buttons, enable voice commands, and remove non essential elements if the user is driving. Digital Assistants (Siri, Cortana, M, Google Now etc.) could use this information to take over and automate certain tasks to ensure that you can focus on the task of driving. The possibilities are endless. We would like to thank the ustwo auto team – Harsha Vardhan, Tim Smith and David Mingay – for their continued support on this project and for mentoring us through the entire process. This project would not have been possible without their guidance. If you'd like to get in touch about anything you've read here, please email us at automotive@ustwo.com.